The UK government is to fund the setup of up to four ‘future mobility zones’ in which a range of transport models and services will be tested, including integrated mobility-as-a-service applications that “make it simpler and quicker to book and pay for transport”. 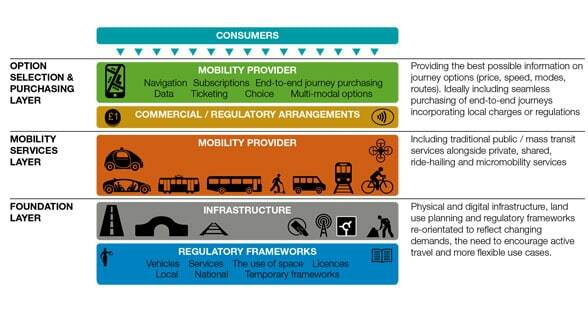 Future Mobility Zones aim to demonstrate how cleaner transport, automation, and new business models and modes of travel could improve travel for people in urban areas. The four areas to receive the government’s £90m (US$119m) funding will be selected following a competition which closes on 24 May 2019. “The best transport technologies of the future will not just make journeys faster, they will also make them safer, easier, more comfortable and more affordable,” the UK’s Minister of State for Transport Jesse Norman explains in ‘Future of Mobility: Urban Strategy’, an in-depth guide to the UK government’s transport innovation plans. A Future Mobility Zone is already in operation in the West Midlands to capitalise on existing transport innovation in the area. Among the ideas being investigated are Mobility Credits to incentivise car owners to make use of electric vehicle hire; on-demand public transport; shared taxis; and walking and cycling. People taking part in the trial would receive credits to cover their costs. A travel app would help them to work out the best type of transport to use and how to maximise their credits. Transport for West Midlands is also considering expanding its NFC transport ticketing scheme to include payment for parking and gyms and extending trials of self-driving cars as well as looking at how digital technology could improve live traffic information.